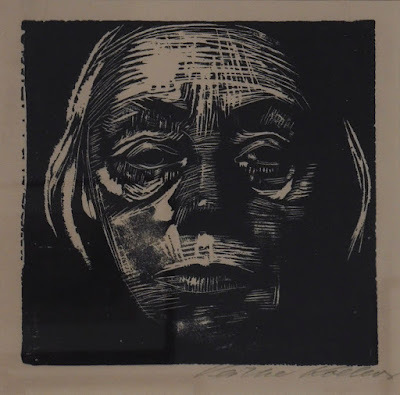 The horrors of war are unfortunately ever present; Käthe Kollwitz's images of the emotional and physical ravages of WW I could represent many wars, and they are harrowing. A large group of Kollwitz's drawings and prints associated with her series of seven prints––Krieg (War)––is now on view at the Davis Museum of Wellesley College, and I was very lucky to have had the opportunity to see them. 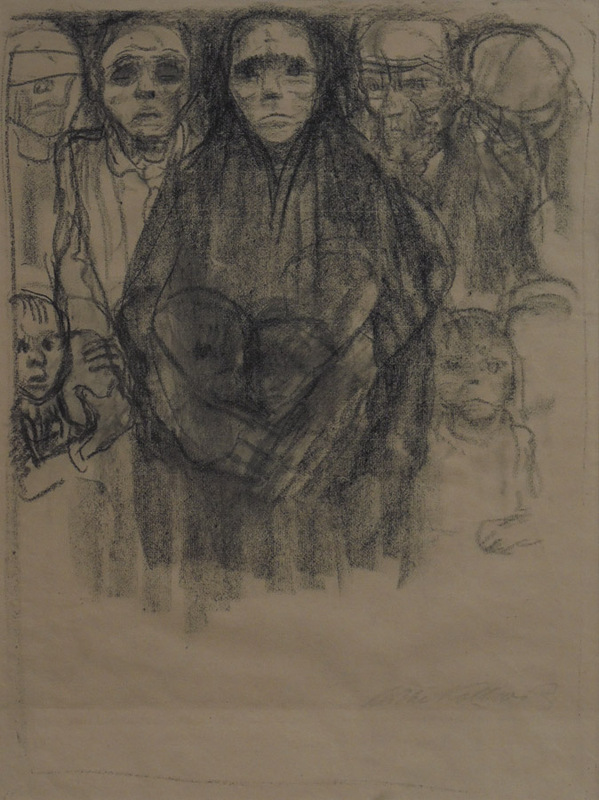 I had previously seen one or two, and many in reproduction, but standing in front of actual drawings and prints on the theme of war was very moving. 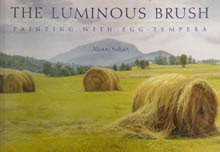 You can see from her self portrait that she has an uncompromising vision. Pensive Woman is a heart rending image, so simple yet speaking so clearly of hopelessness. The evening before seeing this show I watched the Netflix film Beasts of No Nation, an overwhelmingly horrifying view of war in an unnamed African nation, and the child soldiers forced into that war. 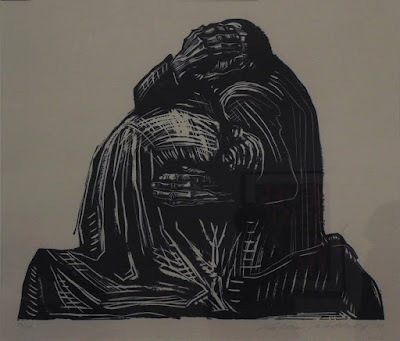 Still shaky from that experience, the Kollwitz works struck me even harder than they might have otherwise. 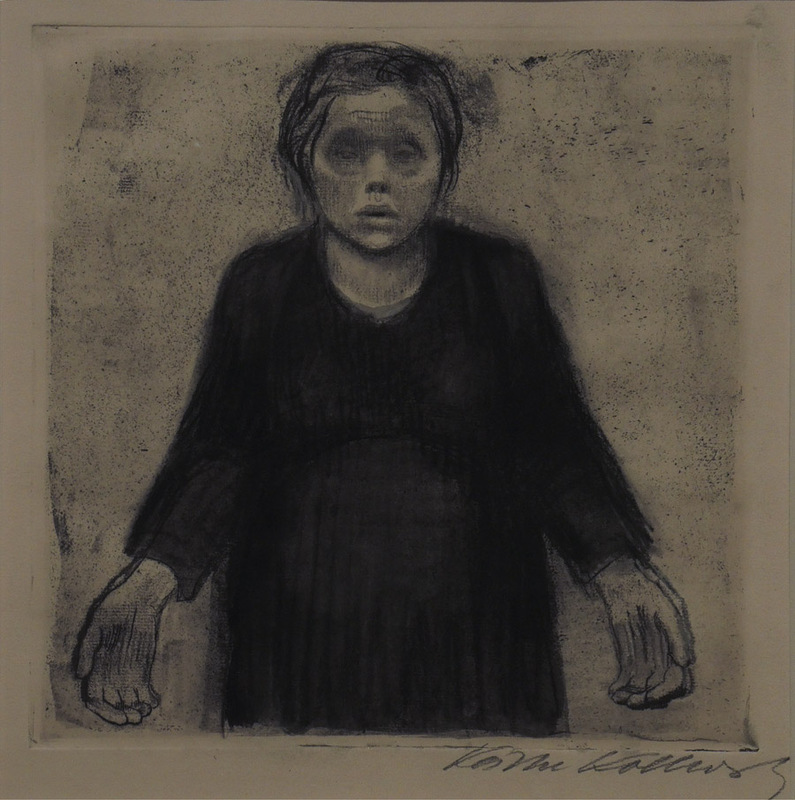 The Widow, 1918; soft-ground etching with hand additions in graphite, charcoal, and brush and gray wash. 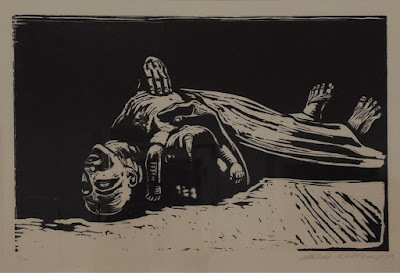 The slightly open mouth, the sunken eyes, the large open hands, all express grief; that expression is heightened by the depth of black of the widow's dress. Kollwitz's youngest son was killed at the beginning of WWI, in 1917, on a battlefield in Flanders. 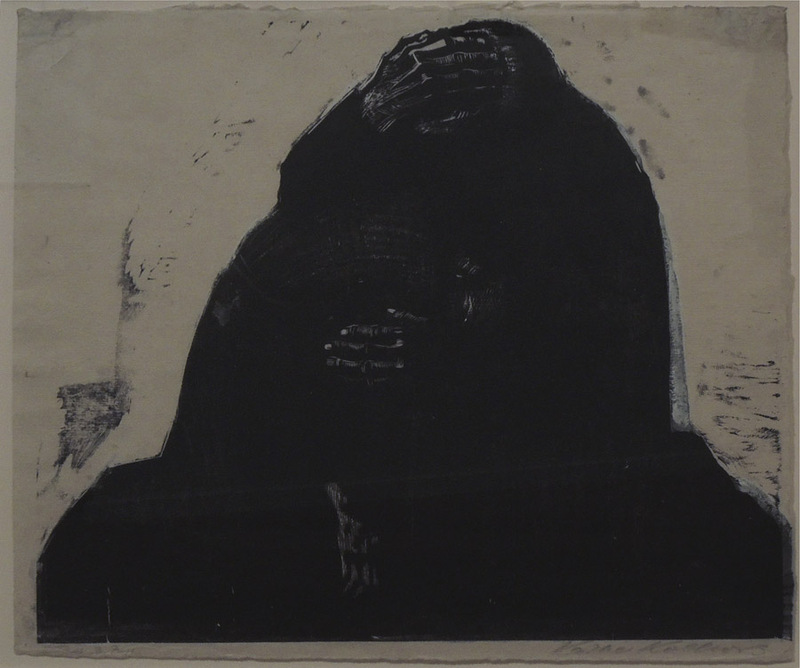 A few years later her grief became art: two parents supporting each other in their mourning. The exhibition was interesting in that it presents various states of the final prints for the series, plus drawings. 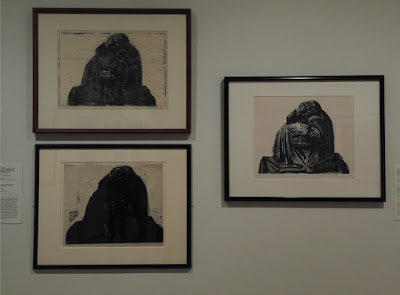 They are a worthy companion to Goya's Disasters of War. I love this deep deep dark version of this image. 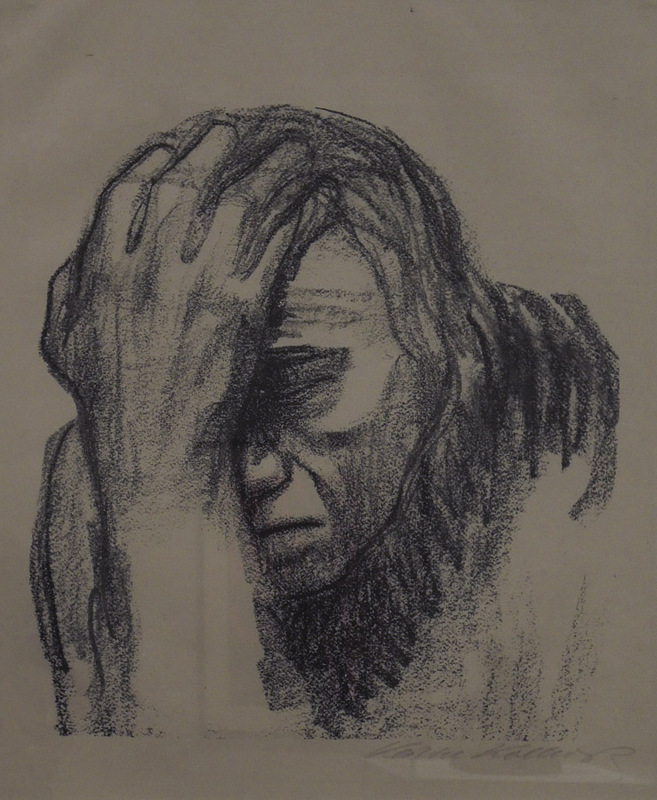 In her diary she noted that "pain is very dark". However, the version Kollwitz chose for the series was more open, though still powerful. 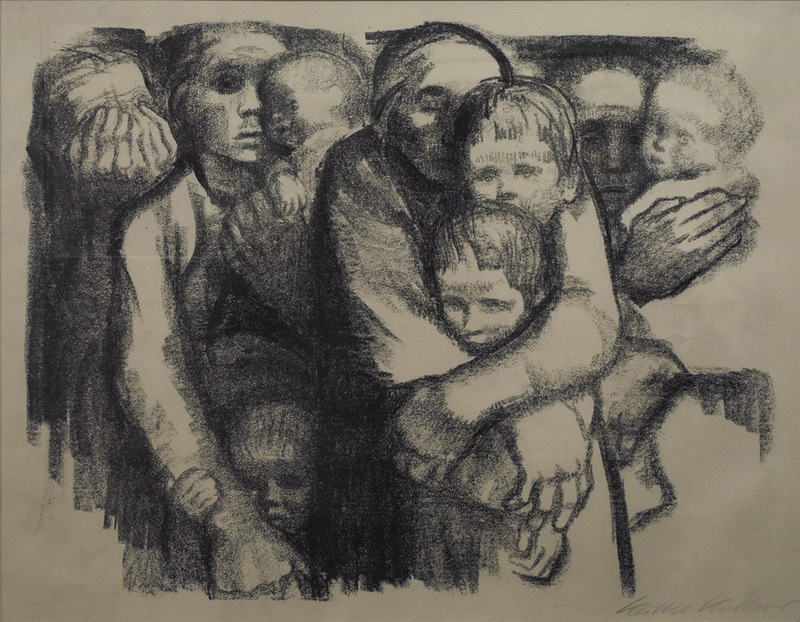 Mothers Protecting Their Children, 1918; charcoal on laid paper. The Mothers, 1921; india ink and opaque white watercolor. 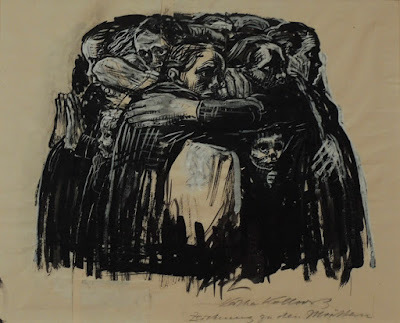 .....but we can see how Kollwitz intensified the image by having the women huddle together, trying to form an impenetrable mass. In the final woodcut, the whites highlight the fearful faces, the enclosing hands. 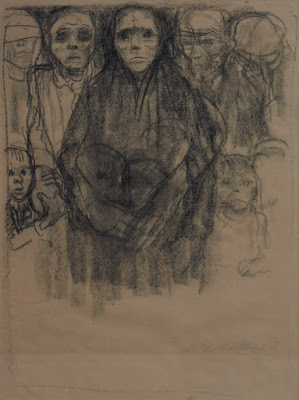 The Survivors, 1922-23; charcoal on laid paper. 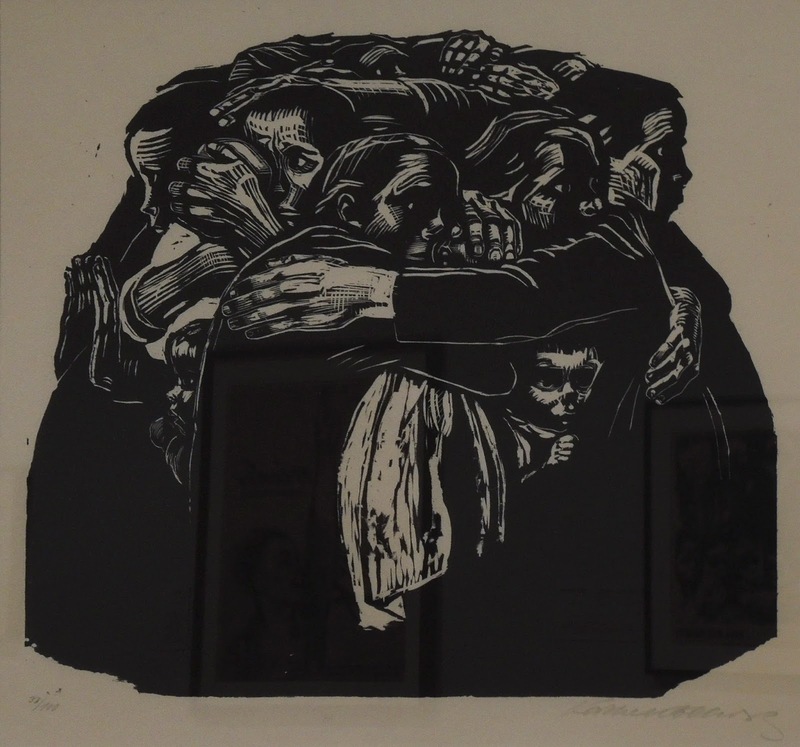 ....and for the survivors, pain and grief, though with a steadfast will to survive. Why oh why do we do this to ourselves over and over and over again? She certainly did capture the horrors of war. Just seeing the Refugees from the current wars streaming into Europe and other places makes my heart break. Seeing it on paper...even more sad if that is possible, especially the survivors. 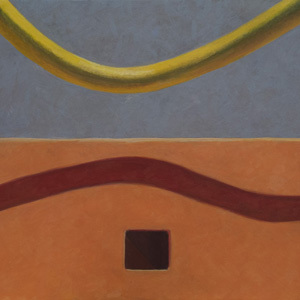 Lisa, I think there's a distillation, or concentration, of feeling that happens with an artist's work that surpasses documentary photos. The use of "we" in the last sentence is so thought-provoking. It can't be anything but "we", since all of us are of the same species.